In these series of articles about performing file system forensics on a Windows system we covered the evidence acquisition in the first article. The second article was about processing the evidence and creating a timeline of the NTFS metadata. The one below will be split in two parts and will cover the analysis of a Super Timeline and the different artifacts. The main focus will be on parsing and analyzing Windows Event Logs. In this article we will not cover the creation of the super timeline because has been covered already in this article using Plaso engine. We will move on directly to the analysis and artifacts. For contextualization Plaso is a Python-based rewrite of the Perl-based log2timeline initially created by Kristinn Gudjonsson and enhanced by others. The creation of a super timeline is an easy process and it applies to different Microsoft Windows operating systems. However, the interpretation is hard. The Plaso engine is able to parse different type of artifacts such as Windows Event Logs, Windows Registry, Windows Prefetch files and many others. During the analysis it helps to be meticulous, patience and it facilitates if you have comprehensive file systems, operating system artifacts and registry knowledge. One thing that facilitates the analysis of a Super Timeline is to have some kind of lead about when the event did happen. Then you start to reduce the time frame of Super Timeline and narrowing it down. Essentially we will be looking for artifacts of interest that have a temporal proximity with the event. The goal is to be able to recreate what happen based on the different artifacts. A good starting point is looking at the different Windows Event Logs that were recorded in the Super Timeline. But before we dig into our Super Timeline and the WinETX artifacts let’s review some concepts about the Windows Event Logs. The Windows Event Logs are a good source of information when looking for potential attacks or misuse of the system. 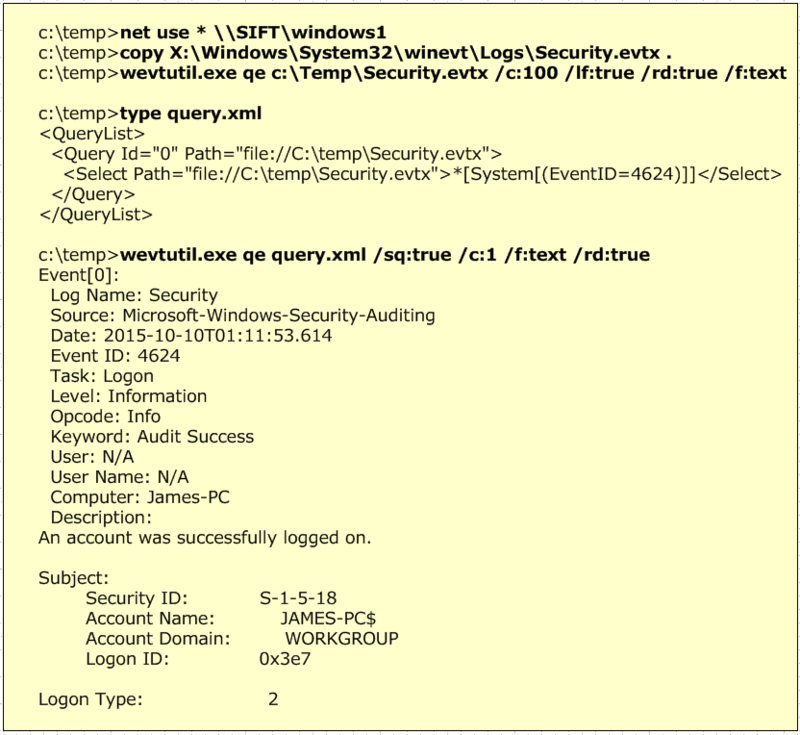 The Windows Event Logs include all the records that are a result of the enforced auditing policy i.e., the amount of information is dependent on the Audit Policy settings. For example on a standalone Windows 7 default installation the Audit Policies state that there is no auditing. This can been seen in the local group policy settings as you could see in the below image. However, there is some auditing enable and you could verify it using the command line auditpol.exe tool. The below picture shows the auditpol.exe output in the same Windows installation from where the group policy stated that there was no auditing enable. This inconsistency is describe by Microsoft here. From Windows Vista onwards the Windows Event Logs are stored in the %SystemRoot%\System32\Winevt\Logs folder and contain a .EVTX extension. This new format called Windows XML Event Log (EVTX) format super seeds the EVT format used in Windows XP. Apart of Event Logs from Vista onward there are Application and Service logs that record events about a particular component or application rather then system. On a Windows 7/2008 System many event log files can be found depending on the roles performed by the system. In here you can even find application event logs. For example if the system has Symantec Endpoint you will have a “Symantec Endpoint Protection Client.evtx” file. The different categories are described here. Nonetheless, there are three important files. The description was taken from Microsoft Technet website. To be able to parse and read these files there are good open source tools available. The work pioneered by Andreas Schuster in 2007 and afterwards by Joachim Metz on Libevtx were key to develop this capability. One tool is the Plaso engine but that we already covered in another post. Another is the Python-evtx created by Willi Ballenthin. This tool written in Python has the ability to read the EVTX format. The tool is available on Github and contains different modules. 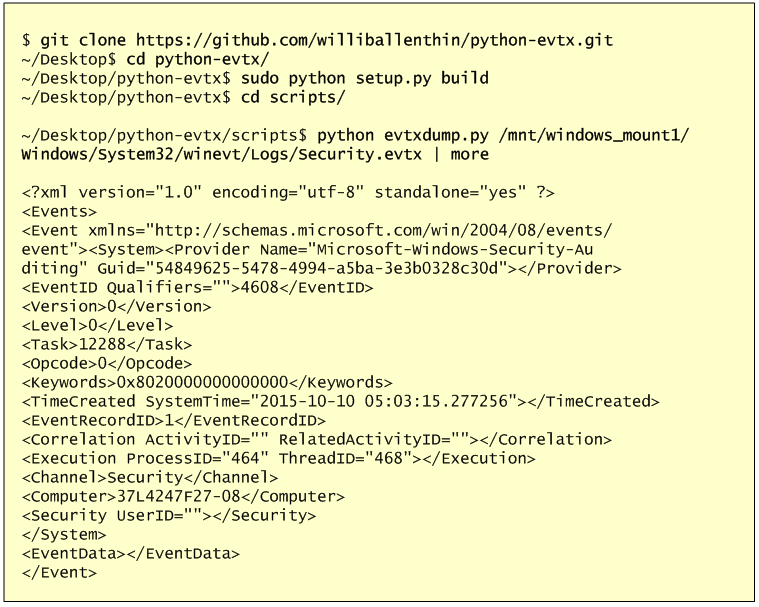 One is the evtxdump.py that allows us to dump the contests of the Event Log files. The following picture shows the installation and a simple usage of this tool in the SIFT workstation. Other than using open source tools you can also use Windows Event Log Parser from TZworks. Or you can use the native Microsoft tools. For example using the Windows GUI and use Event Viewer or you could use Windows CLI and use wevtutil.exe. Another option is the versatile Microsoft Log Parser. The below pictures illustrates an example where we map a network drive to point to our evidence that is mounted on the SIFT workstation. Then we use wevutil.exe to query the Event Logs. First example with no filter and second example with a XML filter that was created using the Windows Event Viewer. Please note that in this exercise the Security.evtx contains logon events because the system is not part of a Active Directory Domain. If that was the case the logon events will be recorded on the Domain Controllers. 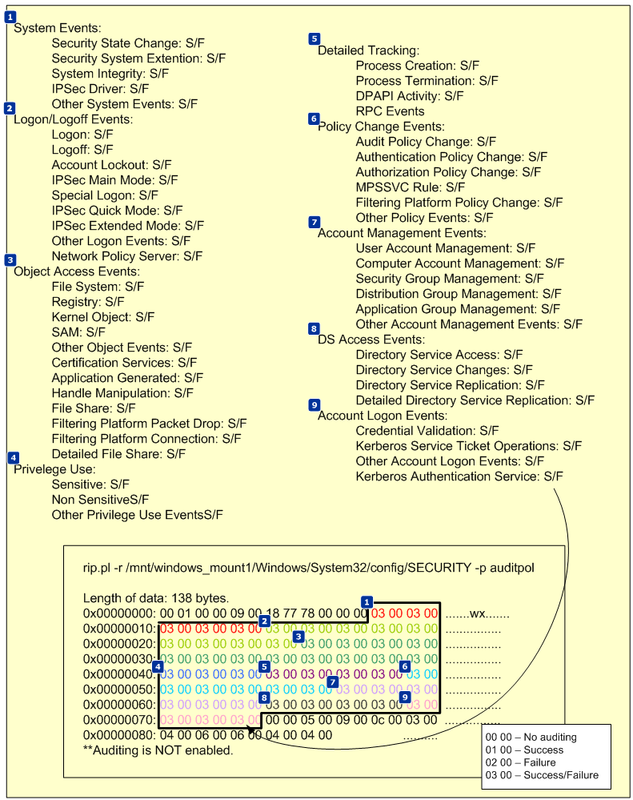 Now, that we briefly covered the Windows Event Logs let’s review Audit Policy Settings. This is important because will allow us to to know what to expect on the Event Logs. The Audit Policy Settings control which events will be recorded on the Event Logs. To be able to read the Audit Policy settings we need to read a special Registry key. At the time of this writing I could not find an open source tool that allowed us to retrieve these settings from a forensic image. 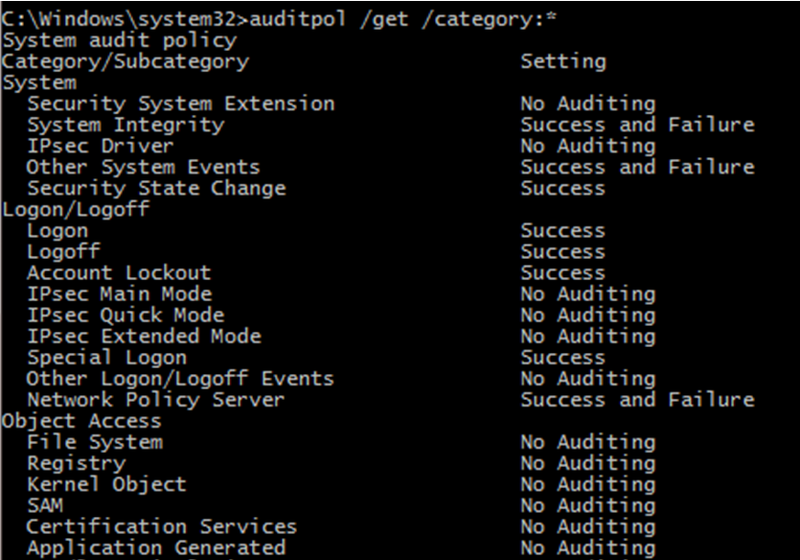 The Audit Policy settings are stored in the registry under the HKEY_LOCAL_MACHINE\Security\Policy\PolAdtEv key. RegRipper is able to parse and output the contents of this key on Windows XP but seems to have issues on Windows 7 as you could on the below image. Nonetheless, it can retrieve the contents of the key. By having the contents of the registry key we can use the paper created by Teru Yamazaki that describes the structure of this key on newer Microsoft operating systems. With the information we can understand which audit settings are defined. The below image illustrates a manual mapping between the different events and the possible settings. Teru Yamazaki also has an online tool on his website that allows you to parse this information automatically. You can get the audit policy from the SECURITY registry file using RegRipper and paste the contents into his tool. The output will be in Japanese but you can use Google Translator. In this exercise as seen by the Audit Policy settings we have Success and Failure turned on for all the event types. Now that we know which kind of auditing settings we can expect and we reviewed some of the tools we could use to read the Event Logs we can start analyzing our Super Timeline and WinEVTX artifacts. This will be done on part II.